This website hosts articles written by a variety of contributors. Each contributor assumes full responsibility for the reliability and accuracy of the information contained in each such article, and this website and its editorial board specifically disclaim any responsibility for the content of any article by any of its contributors. In addition, over time new scientific and medical information becomes available, laws and legal enforcement polices change, and laws and legal enforcement policies governing the use of substances discussed on this website vary from jurisdiction to jurisdiction. The reader is advised to carefully consult appropriate sources for the most current information on scientific, medical, and legal issues. Material on this website is not intended to and should not be used as a substitute for personal consultation with knowledgeable physicians and attorneys. The information on this website is offered for informational use only, and is not intended for use in diagnosing any disease or condition or prescribing any treatment whatsoever. 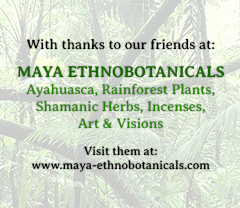 The information on this website is not intended to encourage the use of ayahuasca or any other ethnobotanical. The website specifically cautions against the use of ayahuasca or any other ethnobotanical in violation of the law, without appropriate professional guidance and monitoring, or without careful personal evaluation of potential risks and hazards. This website and its editorial board specifically disclaims any liability, loss, injury, or damage incurred as a consequence, directly or indirectly, of the use and application of any of the contents posted herein.